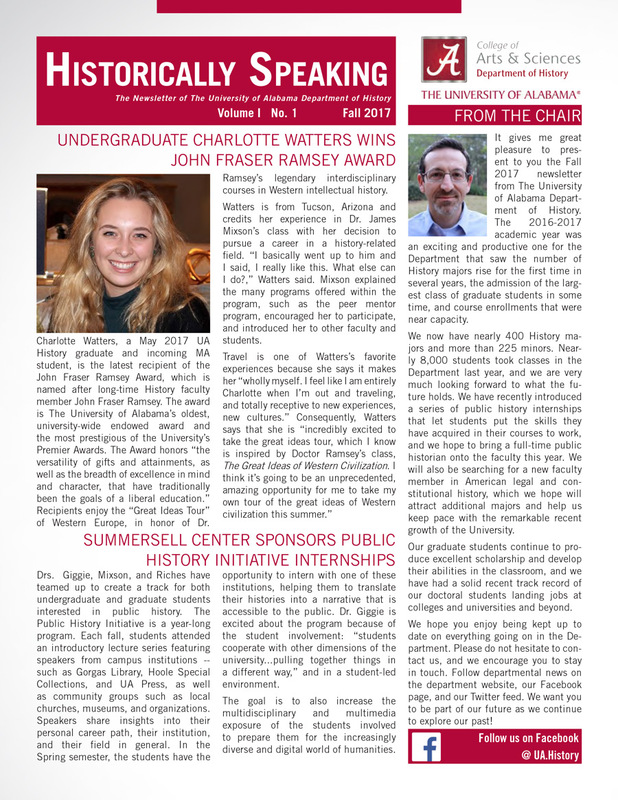 Our New Department Newsletter, Historically Speaking, Now Available! We are pleased to announce that issue number one of Historically Speaking is now in print and on its way to faculty, students, alumni, and friends of the Department of History at The University of Alabama. Our intention is to produce and send print copies of the newsletter each fall and another, electronic version, each spring. An electronic version of the current issue is available at for those who can’t wait for the postman to deliver the hard copy version! Thank you to everyone who contributed to this publication, especially the members of the department’s Communications Committee: Drs. Sarah Steinbock-Pratt, Juan Ponce-Vazquez, Holly Grout, and John Ratliff, as well as our communications coordinator, Molly Buffington.